I woke up in such a good mood this morning, and so far, the day has not let me down. It’s been rather wonderful, even if I say so myself, so let me share some of this awesome with you fine internet folk! I went up to Chester this morning, which in itself is nothing really new as I tend to go there most Saturdays – it’s where my nearest Games Workshop store is, after all. I picked up some Ironjawz, after eyeing them up for a long while, so I’m hoping they can lift me out of the painting lapse I’ve been in for a while now. 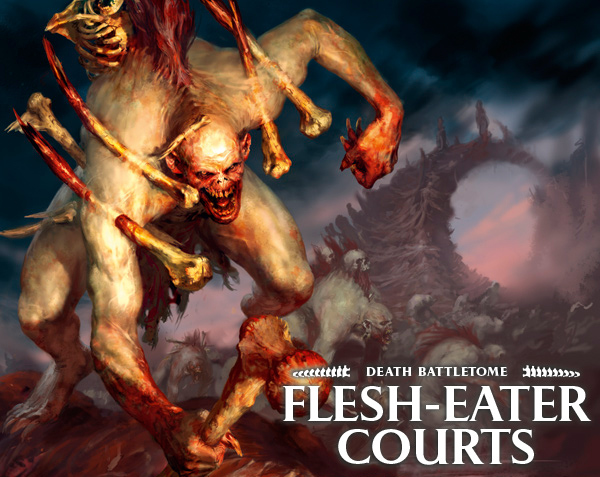 This week is all about the Flesh-Eater Courts, the new zombies basically being repackaged. However, while there aren’t any new models coming, there is a new Battletome to accompany the release, something I found quite interesting. We’ve seen this with Seraphon/Lizardmen, of course, but still. There is something irresistibly creepy about the lore of these guys, and I find myself marveling at the way Games Workshop manages to seduce me so well – I was actually considering a pre-order! While in Chester, I also picked up some books, including the new Bloodlines novel that purports to fill in many of the gaps in the lead-up to The Force Awakens, and another Justice League book, The Grid. I haven’t mentioned some of the recent comics I’ve been reading, so I think I’ll do a bit of a catch-up here, anyway. Starting with The Grid, this appears to be one of the stories that leads into the Trinity War crossover event, and starts by swelling the ranks of the Justice League with all manner of extras, as seen during the previous arc, Throne of Atlantis. We have Firestorm, Atom, and Element Woman, among others, and if I’m honest, I feel a bit like we’re diluting the awesome team dynamic that hooked me into the Justice League in the first place. The first part of the book, anyway, deals with the attack on the League by the villain Despero. He is given a Kryptonite ring and attacks the Watchtower, causing it to plummet to the earth and, when Superman flies up to prevent a catastrophic hit into the east coast, he is beaten back by the ring. It’s only by the intervention of Martian Manhunter that Despero is driven back, though he flees before any of the main Justice League show up on the scene, leaving everyone thinking Atom defeated him. It was a cool story, though there are a lot of pages where nothing really happens – at least, nothing that feels like it interests me somehow. Which was a shame, if I’m honest. The second part of the book is the Trinity War crossover, something I got really confused by when I tried to read the issues in Justice League of America. The Trinity War crossover arc deals with all three Justice Leagues – that of Superman et al, the JLA that includes Martian Manhunter, Hawkman et al, and Justice League Dark, which features Constantine and Deadman, among others. JLA started off pretty interestingly, I thought. Amanda Waller and Steve Trevor set up a second Justice League, with the idea that it would stop any possible threat from the main Justice League of Superman etc. They investigate the Secret Society of Super Villains in what was a fairly confusing storyline, for me, though it was cool to see a new group of superheroes interact into a cohesive whole, something I really enjoyed about the first Justice League book. It was also great to read a story with Martian Manhunter, a character who had intrigued me since playing the DC deck-building game. Almost completely off-topic now, I’ve also been reading the first Green Lantern book, Sinestro. I’ve never honestly been all that interested by this guy but, as happened with Aquaman, I was intrigued following the first Justice League book. I actually bought this one months ago and, after the success of Aquaman, I’d feared I might become enamoured of another superhero and throw loads of money at the various Lantern books. Well, it’s with something of a heavy heart that I say, I wasn’t as keen on this solo series as I was with Aquaman. Don’t get me wrong, it was nice to see where this Hal Jordan came from and whatnot, but given the fact that he doesn’t actually have his powers during this book, and is essentially a pawn of Sinestro’s attempt to rescue the natives of his homeworld, I felt it was a bit odd, and I couldn’t really see where this fit with the Green Lantern of the Justice League book. I’m prepared to give it the benefit of the doubt, however, and have ordered the second volume, which is on its way to me as I type, so my opinions may change soon, but yeah, I was feeling a bit meh about this. Plus, the art changed for the final story in this volume, which I really didn’t like! At any rate, I’m sure I’ll be getting round to more of the comics on my shelf soon. Having read so much good stuff about it, I’m decided to move onto Star Wars: Bloodlines next, so I’ll be back soon with my thoughts on that! Hope you’re all having as excellent a Saturday as me! Previous Previous post: Revenge of the Fifth!